Hello friends. I hope you're all having a good week! Today I'd love to share with you my favorite dry shampoo, and a few others I enjoy using. 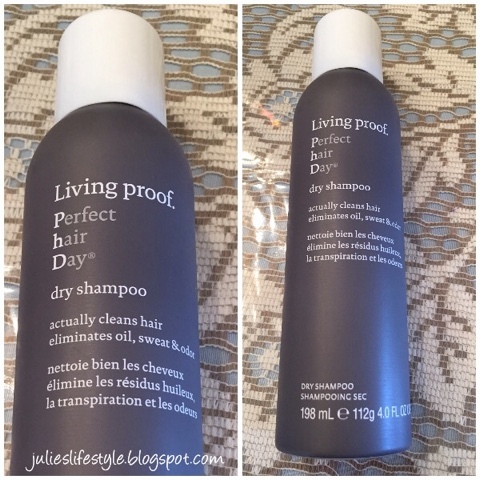 My favorite hair product is called Living Proof Perfect Hair Day Dry Shampoo. I happen to have very fine hair and it's not that easy for me to take care of. I do not wash my hair everyday, (usually every other day), and I when I need to freshen it up, I use dry shampoo. Usually I like taking my shower in the evenings, and then wash my hair and condition it. Then in the morning I use dry shampoo and with a few sprays I can manage my hair to look good. After that I usually use a little bit of hairspray and I'm good to go. This dry shampoo really cleans my hair well and eliminates oil, sweat, and odor. This would be a great product to take along to the gym, as your hair gets all wet and sweaty after a good workout. What I like about this hair product is that there is no perfume smell and you only need to spray a little bit in your hair to work well. I also like to bring dry shampoo with me when I'm traveling, as it's so easy to use if I don't feel like washing my hair that day. To read more about this hair product, you can click HERE. This dry shampoo was purchased at Sephora. Another dry shampoo I love using is Not Your Mother's Clean Freak Refreshing Dry Shampoo. I like the way this product works and it only costs $5.99. I bought mine at Walgreens and it's available in most drug stores. I like using this product because it works well on my hair, with no perfume smell. It also seems to add a little bit of body to my hair. I love the price of this dry shampoo too! There is another dry shampoo that I've used and I felt it was just ok, called DETOX Dry Shampoo by DryBar. This product had a very overpowering perfume smell to it, that just made me sneeze every time I used it. I bought a sample set of DryBar products at Sephora, and I was happy that I could sample this product that way and not buy the full size. In New York City they have stores where you can have your hair washed and blown dry with their products for $40! Who knows, you might like this product and it's worth a try. Another dry shampoo that I have tried and liked a lot is called Klorane Dry Shampoo and it worked well on my hair. I bought this product at Duane Store drug store. There are so many benefits to using dry shampoo, and they are really convenient to use if you are rushed in the mornings like me. I happen to like using the aerosol form, but they also come in powder and mousse. * It's a great way to replace washing your hair if you do not have time to wash it. * Dry Shampoo makes your hair style hold up and last longer. * Colored hair lasts longer since you are shampooing less. * Using dry shampoo may add volume to your limp and flat hair. * The product can help cover up dark roots if you dye your hair blonde. These are just a few reasons why I like using dry shampoo. Have you ever used dry shampoo and do you have a favorite that you like using? To see how I made my own homemade DIY Dry Shampoo you can click HERE. To see more makeup posts you can click HERE! ** This is not a sponsored post and my own opinions. Thanks for stopping by, and have a great end of the week and weekend. Jess and I will see you back here on Monday for our Cooking and Crafting with J & J Link Up! Wow these sound good. Who knew there were so many to pick from. I love Batiste for the smell and how it makes my hair feel and look but I really haven't tried any others. I don't use it that often, just when I'm trying to squeeze an extra day between shampoos! I have to try this, I use Dove Dry shampoo and love that it doesn't have a sticky feel. Wonderful reasons to love this dry shampoo. I've yet to try a dry shampoo, but after reading your rave reviews, I'm willing to give it a lather! Great post about this type of shampoo. I have never tried this product, and you have answered all of my questions regarding it. I'm very sensitive to product scents and some formulas. I will definitely will give it a try. Have a great day! I have not tried dry shampoo yet, but I have often wished I had some for those rushed days. Sounds interesting...I will have to look for the brand that is fragrance free! I have the opposite problem... super thick hair that takes FOREVER to dry. A will have to try this because and extra day between washings would give me a lot of time back!! Thanks for these reviews! I have never tried the dry shampoo products on the market. The last time I tried something to avoid washing my hair was in college and I used baby powder. Remember that? That was in the late 70's/early 80's. It did not work well!! Great reviews on these dry shampoo's. I think they would be great for traveling. Remember the dry shampoo called Psssst from the 80's!!!!! These sound so much better. For some reason I've never tried dry shampoo, and it seems like I'm not alone based on the comments. It's really a great thing to have handy for those times, as you mentioned, when it's not convenient to wash our hair. I've seen this product on the shelves, so it's good to know you like it! thanks for your tips here..i've never used dry shampoo but if i ever do, i'll give yours a try. come over and get your name in the hat for a beautiful enamel RAMSIGN from Denmark...today and tomorrow are the last days and you can leave as many comments as you like on my giveaway page. I used to use dry shampoo all the time when I colored my hair b/c I didn't want to wash it too often. I did love the extra body it gave. One good thing if I use it now is any white powder left in will not be visible in my gray/white hair, haha! Nice to see another of your beauty product reviews Julie. I've never tried dry shampoo. You're right though, it'd be great for the gym or for travel! I've been trying to wash my hair less, and I love dry shampoo. Living Proof is my favorite too!